I'm at PyCon, and I spent a lot of the afternoon in the Raspberry Pi lab. Raspberry Pis are big at PyCon this year -- because everybody at the conference got a free RPi! To encourage everyone to play, they have a lab set up, well equipped with monitors, keyboards, power and ethernet cables, plus a collection of breadboards, wires, LEDs, switches and sensors. I'm primarily interested in the RPi as a robotics controller, one powerful enough to run a camera and do some minimal image processing (which an Arduino can't do). And on Thursday, I attended a PyCon tutorial on the Python image processing library SimpleCV. 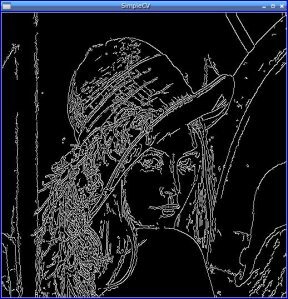 It's a wrapper for OpenCV that makes it easy to access parts of images, do basic transforms like greyscale, monochrome, blur, flip and rotate, do edge and line detection, and even detect faces and other objects. Sounded like just the ticket, if I could get it to work on a Raspberry Pi. SimpleCV can be a bit tricky to install on Mac and Windows, apparently. But the README on the SimpleCV git repository gives an easy 2-line install for Ubuntu. It doesn't run on Debian Squeeze (though it installs), because apparently it depends on a recent version of pygame and Squeeze's is too old; but Ubuntu Pangolin handled it just fine. was no problem. All those packages are available in the Raspbian repositories. failed miserably. Seems that pip likes to put its large downloaded files in /tmp; and on Raspbian, running off an SD card, /tmp quite reasonably is a tmpfs, running in RAM. But that means it's quite small, and programs that expect to be able to use it to store large files are doomed to failure. I tried a couple of simple Linux patches, with no success. You can't rename /tmp to replace it with a symlink to a directory on the SD card, because /tmp is always in use. And pip makes a new temp directory name each time it's run, so you can't just symlink the pip location to a place on the SD card. I thought about rebooting after editing the tmpfs out of /etc/fstab, but it turns out it's not set up there, and it wasn't obvious how to disable the tmpfs. Searching later from home, the size is set in /etc/default/tmpfs. As for disabling the tmpfs and using the SD card instead, it's not clear. There's a block of code in /etc/init.d/mountkernfs.sh that makes that decision; it looks like symlinking /tmp to somewhere else might do it, or else commenting out the code that sets RAMTMP="yes". But I haven't tested that. And, for something a little harder, some face feature detection: let's find her eyes and outline them in yellow. SimpleCV is lots of fun! And the edge detection was quite fast on the RPi -- this may well be usable by a robot, once I get the motors going.